Here they are, painted, weathered and ready for revenue service. 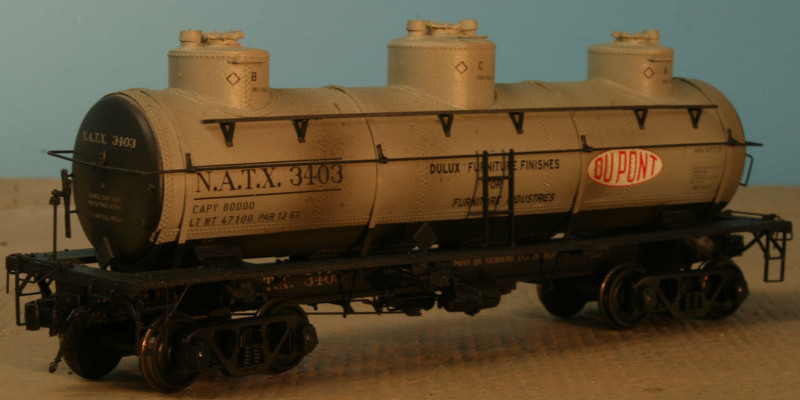 2 three compartment tank cars from Southern Car & Foundry. The first of these kits are intended to be available in Cocoa Beach at the Prototype Rails meet in January. These cars were actually fun to build. Somewhat of a departure for me. They should do very well. I'm pleased and proud to be able to have helped Jon Cagle with there models. Look for more really neat tank cars from SC&F in the future. And I really should mention that both cars are riding on Tahoe Model Works trucks. The best for the best. Step into the Wayback Machine, Mr Peabody. I just mailed this car off to a client. It is a West Shore Line resin kit of a Lehigh Valley "wrong way door" boxcar. It's worthy of note in that the kit is actually 20 years old. While the decals were a bit of a trial, the actual castings were in very good shape. The pattern work makes some of the offerings of today look a little sad. I usually cringe when I open a box and find the old yellow "Alumilite" resin. But in this case the casting was very carefully done and as a result the car was a pleasant build. I also got this car complete. It's the fuel tanker for an experiment the UP conducted with their turbines. 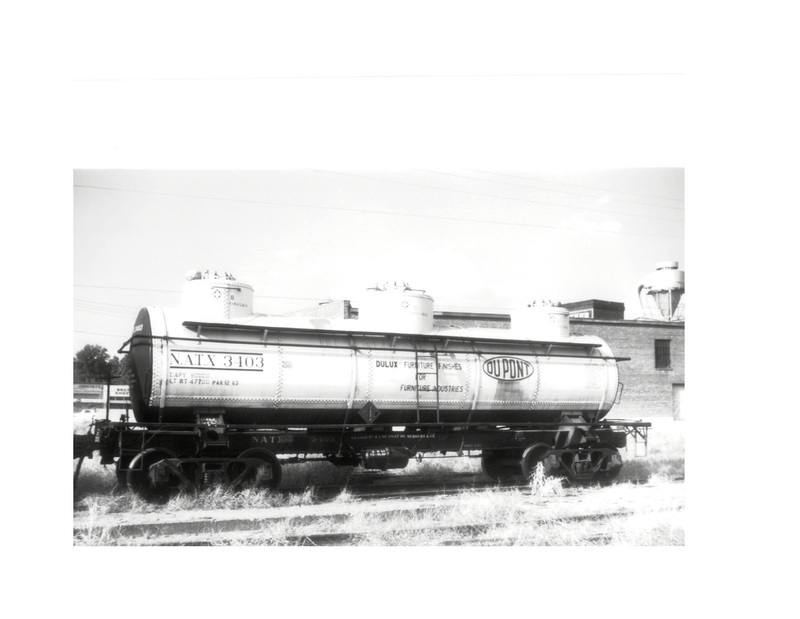 They modified one locomotive to burn propane and as a result required this tankcar for the fuel. The modeling project is well described in the UP Sig publication. To date I've built 3 of these tankcars for clients. Not sure if I want to do another. I've spent the last 2 days building these pilot models for my friend at Southern Car and Foundry. They are 3 compartment tank cars on the Standard Tank Car Co. underframe. The kits feature the usual high quality resin tank castings as well as underframe components we've come to expect from SC&F. One other new feature are hangers for AB brake components. The first set of tankcars from SC&F came with mounting brackets for K brakes only. The models you see here are not complete yet as there was a little hiccup with casting the new parts, so I've taken the cars as far as I can and expect to see the errant bits by Friday. Fingers crossed. That's some kind of landmark, I believe. 10,000 views of this little blog of mine since it was launched. I'm a tad humbled that that many of you are interested enough in what I'm up to. Wonder what the next year will bring? Roof, Windows and Chutes, Oh My! The hobby shop called, the other 2 Tichy coal chutes came in. So I could now build the 4 discharge chutes and frames. The design is a crossblend of the Tichy chutes and the original design. A compromise I can live with. The chutes still require counterweights and rope supports. There are walkways at each front corner and ladders for access to build. But for now it will rest in it's location. I have to do a little landscaping around the rear before I can add the covered unloading section. All in good time. It's stand back and admire time for now. I painted the coal dock with Floquil Aged Concrete. After letting that sit for a couple of days, I broke out the Pan Pastels and the Bragdon chalks and went for it. And I wasn't happy at all. I sent the above photo to my buddy Trevor Marshall and we chatted about processes and desired looks. 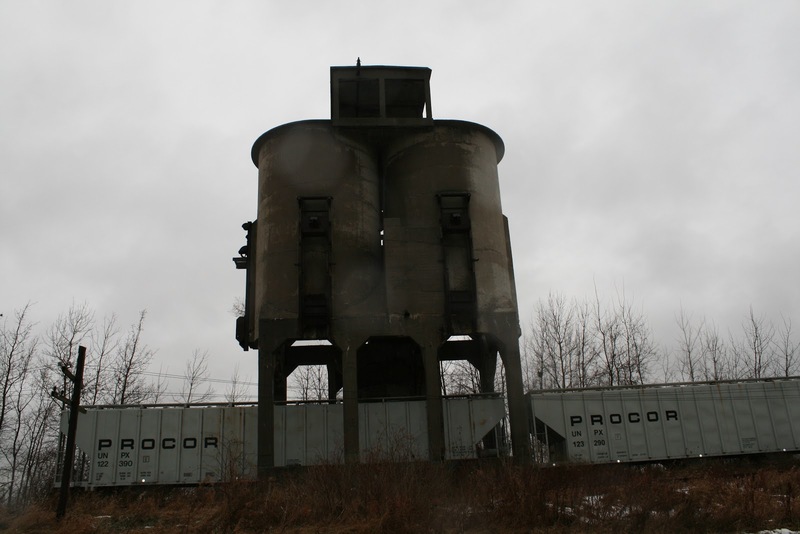 We also found one colour photo of a CN coal dock in service from the era I'm modeling. The vision I had in my minds eye was all wrong. So it was back to the paint shop. A full repaint with Aged Concrete. Then a overspray of regular Concrete. After letting that sit for a bit, I come in with a thin mix of Grimy Black and dusted in some tones and some exhaust stains. I'm going to leave the weathering alone until the coal chutes are installed and see what may be required. The coal dock in it's natural habitat. Man, Those Guys do Nice Work! I've just completed 3 of these kits from my buddy, Jon Cagle, the talent behind Southern Car & Foundry. 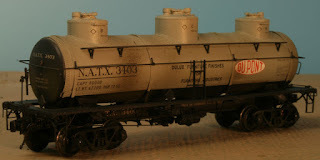 Working from patterns created by Gene Deimling, a truly stunning O scale freight car emerges. Jon is using mixed media in his kits. Laser cutting, photo-etching and resin casting along with injection molded after market parts. By playing to the strengths of each medium really stunning models emerge. I built 1 car for a client and the other 2 are being offered for sale. If you're interested contact me through my website, http://www.elgincarshops.com/contact.php for pricing and shipping details. How do you Carve a Horse? Take a block of wood and remove what doesn't look like a horse. As annoying as that advice can be, it is the approach I used to get the roof done of the Aylmer coal dock. I simply took a sheet of balsa wood, traced the oval shape of the roof onto it, cut it out and then tapered and shaped the slopes with the power sander and finalized with a little hand sanding. I'm not worried about the grain since some form of roofing material will be going on over top. Most likely tissue paper secured with paint. The "concrete" work on the silos and hoist house is now done. Time for painting. I've primed the model with cheap and cheerful grey primer from a spray bomb and once that's dry out comes the Floquil Aged Concrete. Once the other 2 sets of Tichy coal chutes arrive at the hobby shop, I can proceed with the discharge chutes. The beginnings of one you can see in the foreground. Then it'll be time to build the simple roof over the hopper unloading area, a simple enough lean to structure. Again all concrete. But tomorrow it's back to work on freight cars. Have to pay some bills. I have now taken delivery of these drilling templates. They are designed to allow you to accurately layout the mounting holes for the Kadee bracket grabs on car sides and ends. I've been using one for a few months now and I can't say enough about it, or about how much I love the Kadee bracket grabs. They are delicate looking but very robust, made from a very flexible plastic. The clever people at Kadee even created a mounting pin that requires no glue. The items will be up on the Yarmouth Model Works website soon. What you see is the first trial assembly of the under frame for the CPR plywood car kit. Having done this the dimensions for the last of the etched parts can now be worked out and that artwork can be done. The mold for the car body has just today been created. From there the exact dimensions for the running boards can be determined and that data sent off to the laser cutter. I had hoped to have kits in time for the Cocoa Beach Prototype Rails event, but it's not looking likely. But certainly in time for Valentine's day. What better way to say "I love you" than with a resin kit? Work progressed well this weekend on the Aylmer coaling plant. The silos are attached to the leg structure, the sub-roof is in place and the trickiest bit, the angled connections between the silos and the legs was attached and filled with putty. In my head, as work was progressing, I was going over how I was going to determine the actual shape of the the sloped bits that go from the leg frames to the silos. I knew they were going to be ellipses. I knew that the slope was 45 degrees. I know how to draw an ellipse once the lengths of the major and minor axis are known. It's a bit of a pain. Involves pins and string and virgin sacrifice, etc. And then it dawned on me. Take the ABS drain pipe, cut it on the chop saw to the desired angle and the final shape is given. Place this on the sheet styrene and trace. They fit the first time. I'm very pleased with how this is shaping up. Canada Post is starting to frost my weenie! Fair warning! Right now I'm rather cranky. So I went to the post office today to return to a fellow a mailer tube of drawings that he has kindly lent me for a future Yarmouth Model Works project. At the same time I purchased another mailer tube to sent a copy of the drawings to my buddy Aaron. Now the tube was mailed to me from the US for a tad under $4.00. Imagine my shock when the clerk informed me that postage for the tube was going to be $17.00, plus another $1.75 surcharge for it being a mailing tube. I was also informed that the tube I had just purchased was over length, thus subject to a premium charge. Given that the originals were not mine I felt I had to return them in the condition I received them in, but the other set were quickly folded and stuffed into an envelope and mailed for $4.00. Canada Post sells over length mailing tubes that they really don't want to be bothered with and charge more than 4 times the US rate for handling said item. And they wonder why they continue to lose market share. Ever since I went full time as a custom builder of resin kits, a number of people have asked me about keeping my interest level up and maintaining the energy to work on my own stuff. I don't mind telling you it's tricky balance. There are days where I just have to shove the cars aside and do stuff for the shear pleasure of the process. This structure fits the bill. In the winter of 1943-44 CNR built, at the request of the Wabash, a new coaling plant in Aylmer, Ont. The idea was to reduce the number of refueling stops from 2 to 1 for the run across the province. Previously the Wabash would fuel at Glencoe and Nixon, where CN maintained large wooden coaling docks,as well as docks in Windsor and Fort Erie. They were all massive structures dating back to the Grand Trunk days. I find it intriguing that the CNR would invest in major piece of infrastructure like this while there was a war raging Europe and the Pacific. And it's ironic that 7 years after it's construction it would be made redundant when the Wabash dieselized it's Ontario operations. For my purposes, the structure still stands today, deemed to expensive to tear down. Which makes it simpler to model. It's a mere 20 minutes away should I need to look at something. I finally got started on this imposing structure the other day. I started with the supporting framework, built up with styrene shapes following a drawing that was published years ago in an unknown publication that was sent to me by Steve Lucas. I'll be filling all the joints and sanding smooth once I'm sure I'm happy with the look of the unit. The silos are cut from 2.5" ABS drain pipe, which finishes out perfectly for the outside diameter. The roof will be a challenge, as I've yet to figure out how to execute it. As it would only have been out of service for a few months in the era I'm modeling the coal chutes will be added to the final model. This is going to look very sharp once it's done.